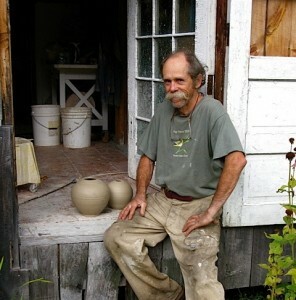 Richard Foye began making pottery in 1969, during his senior year at The University of Vermont. 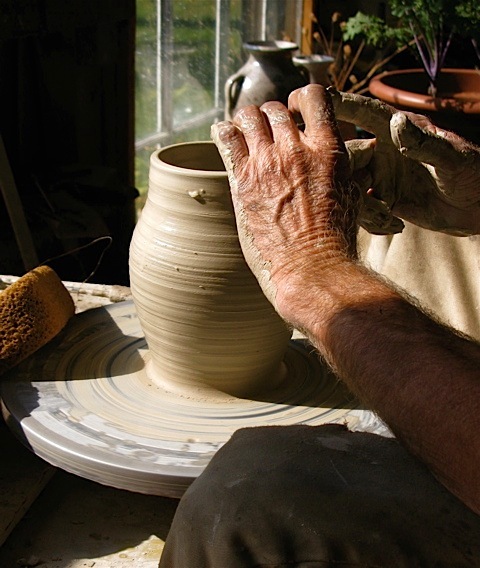 A philosophy major, Richard accompanied his friend Ken Pick to pottery class one day, where he discovered his life’s passion. Watching this artist at his wheel in the late afternoon light, it was easy to see why his vessels are so spectacular. 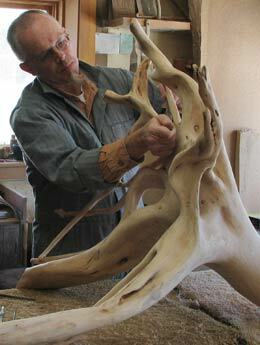 Richard is in love with his work. 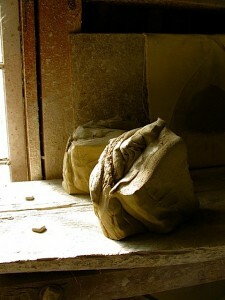 His hands move in a steady yet fluid motion, instinctively molding curvaceous lines and sensual forms from the clay. 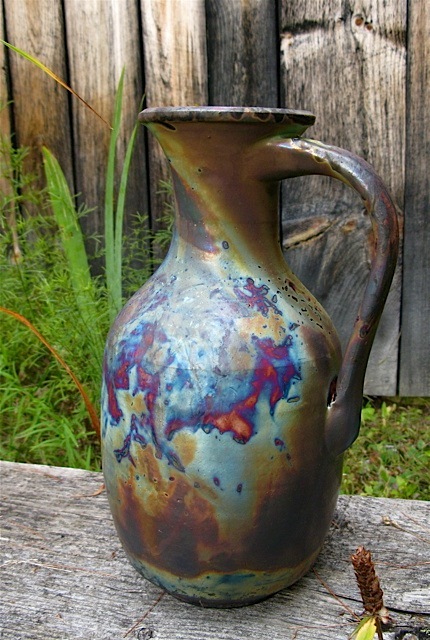 Throughout the 70’s, Richard worked primarily with stoneware and porcelain when, after nearly a decade, he began to experiment with raku. 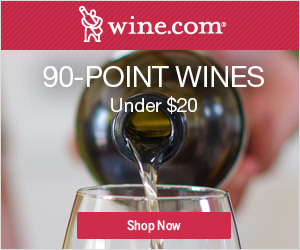 From that point on, Richard found himself focusing on this Far Eastern technique he has come to favor for both its immediacy and serendipitous results. 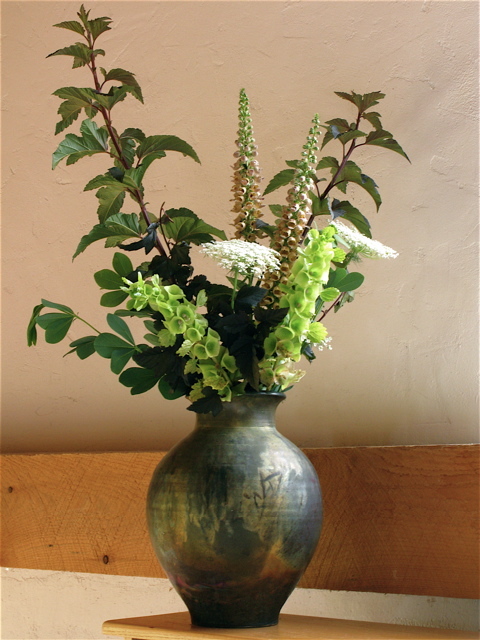 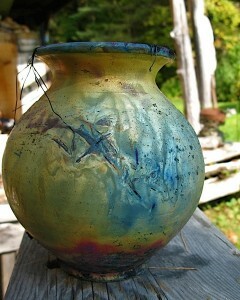 The word raku loosely translates to ‘unexpected, joyful surprise‘. My conversation with Richard naturally turned to philosophy at this point, discussing the difference between what Westerners might call ‘accidents‘ and what Easterners refer to as ‘incidents‘. 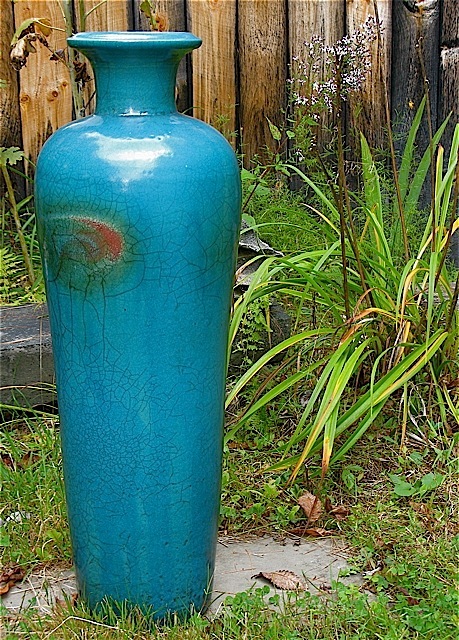 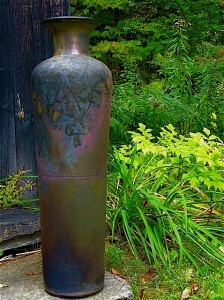 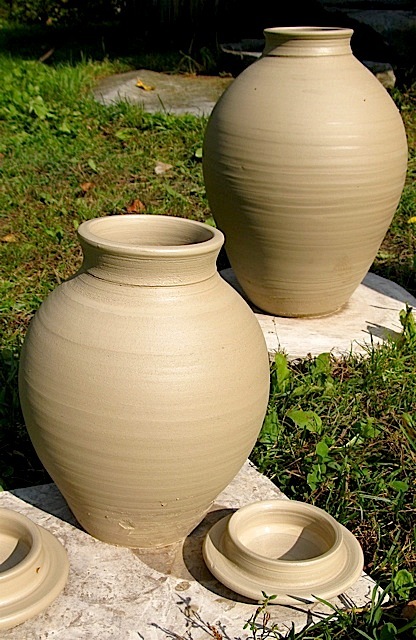 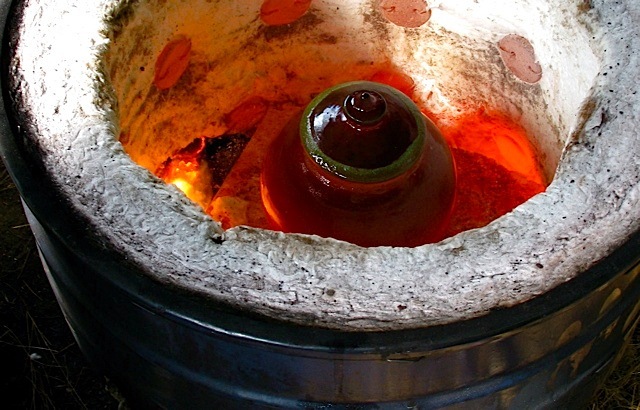 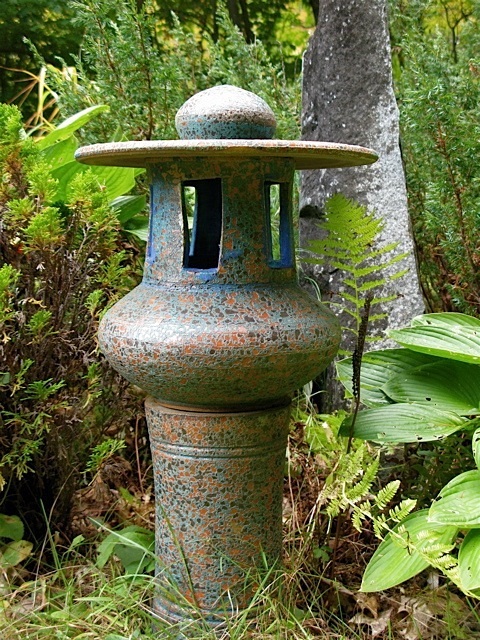 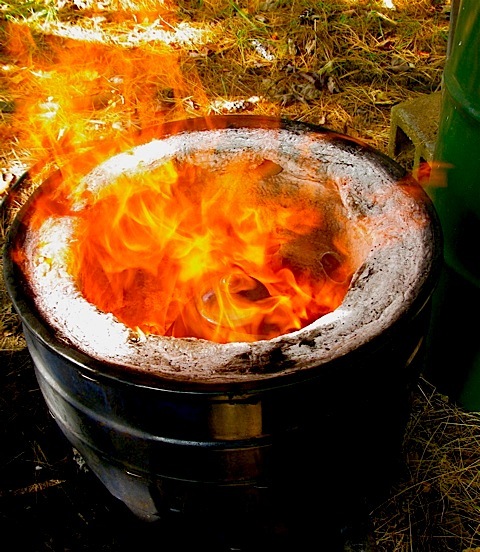 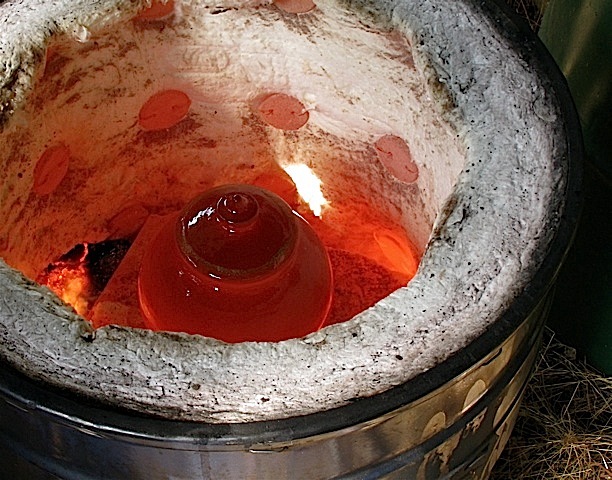 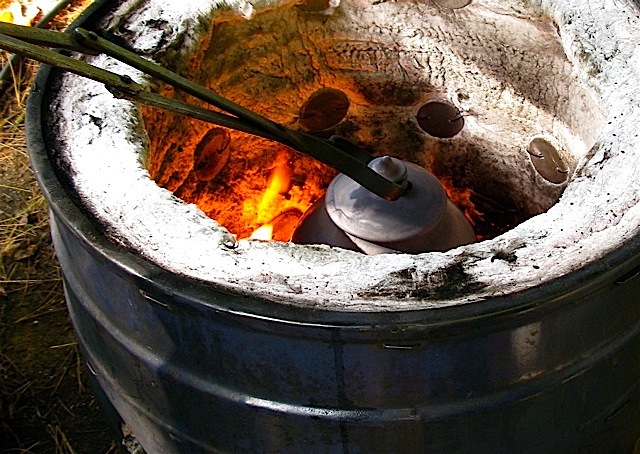 The raku method was originally developed in Korea, and later adopted by Japanese artisans. 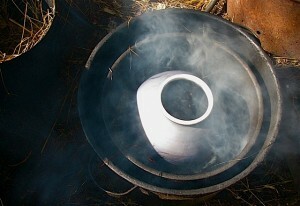 In raku, a pot is drawn out from the fire while still hot and then allowed to cool quickly, producing unexpected, often dramatic results. 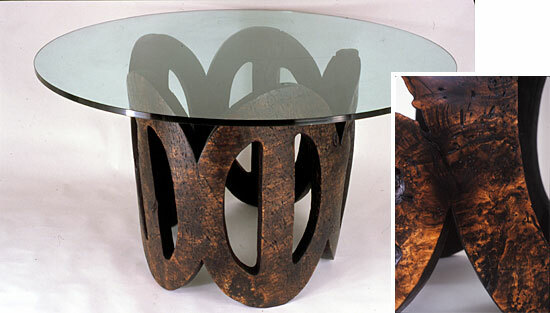 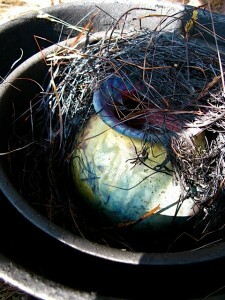 The ‘incidental’ finishes found on raku pieces are inherent to this quick cooling process. Over time Richard developed his own fascinating techniques and signature glazes, (inspired by ancient Near Eastern and Japanese methods), to create the exquisite works of art shown here. From here, Richard’s process becomes positively fascinating to anyone inspired by nature and her beautiful botanical world. 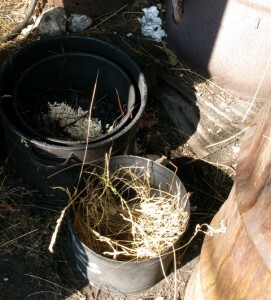 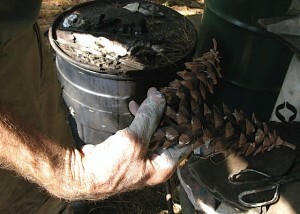 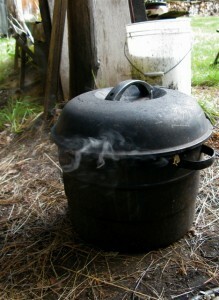 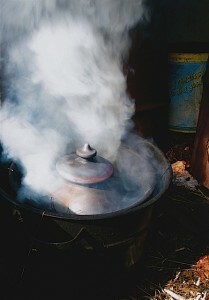 While still red hot, Richard places his vessels within a nest of hand harvested straw and wild grasses from his field – he also tosses pine cones into this smoking, combustible mix. When a lid is placed atop his make-shift ‘double boiler’, the resulting heat, smoke and flame put on quite a show. Meanwhile, inside the vibrating pot, the straw fuses with the glaze to form exquisite, unpredictable patterns on Richard’s shapely vessels. 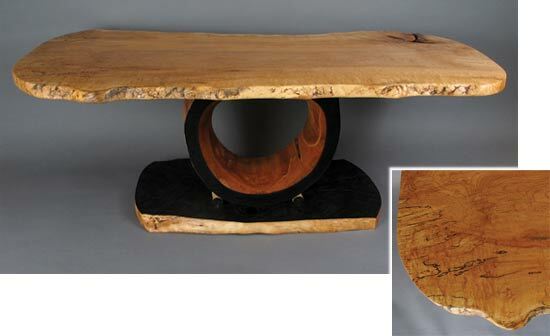 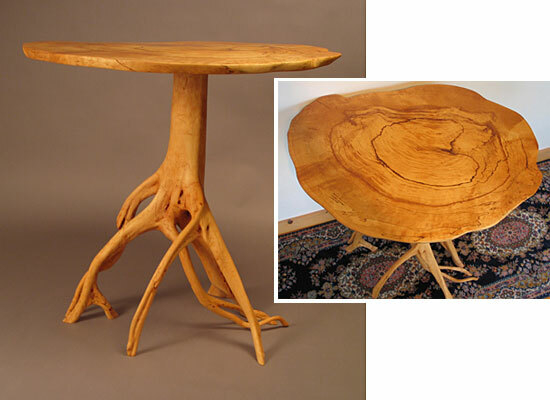 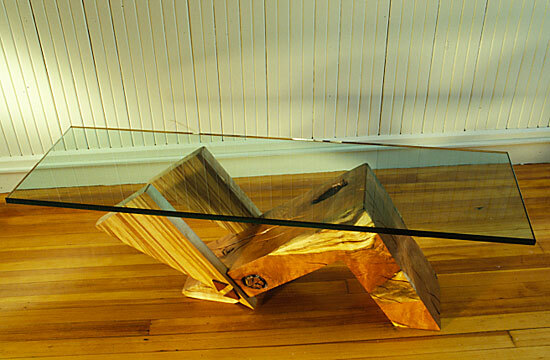 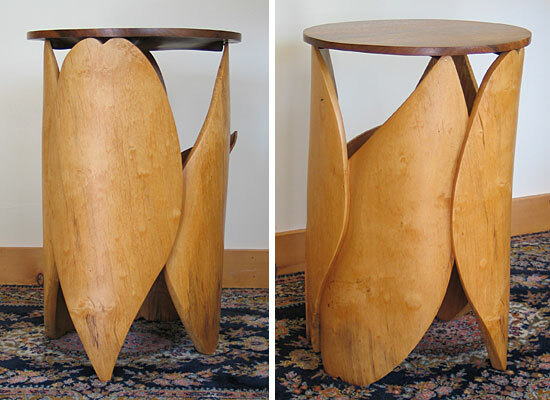 Richard Foye shows his work in galleries and craft exhibitions throughout New England, and at home in Vermont. 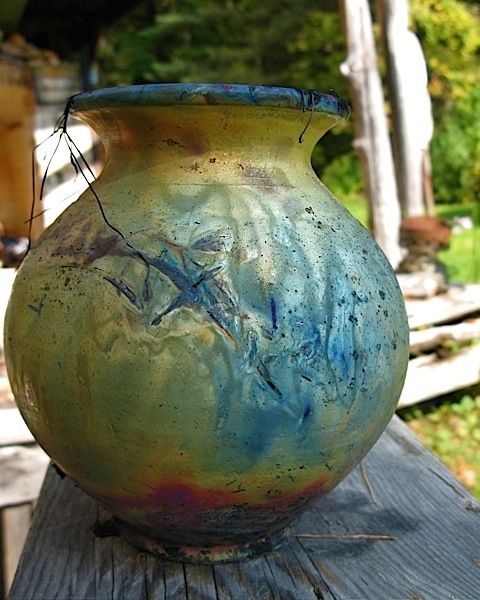 The Rock River Artists group holds an open studio tour every summer, and to many a gardener’s pleasure, Richard’s studio is conveniently located one door down from Olallie Daylily Gardens. 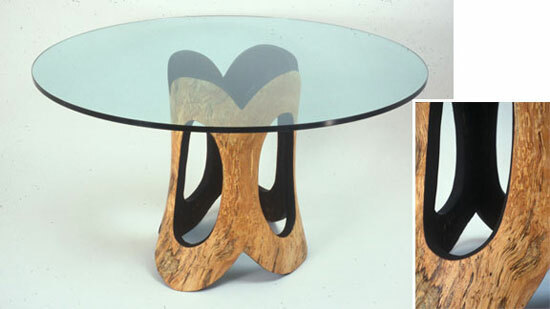 The combination is more than tempting to this nature lover on an autumn day. 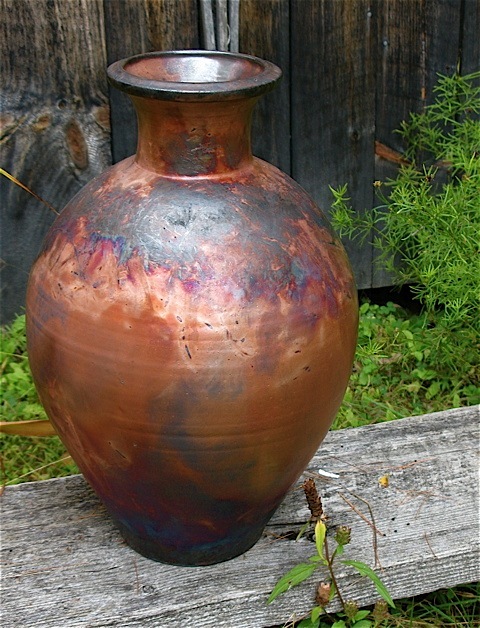 If you would like to make a visit to Richard’s studio, be sure to call ahead, as he participates in a wide variety of craft shows and artisan exhibits throughout the year. But if you tell him you read about his raku process on The Gardener’s Eden, I am sure he will be more than delighted to give you a tour when he is back at his studio home. 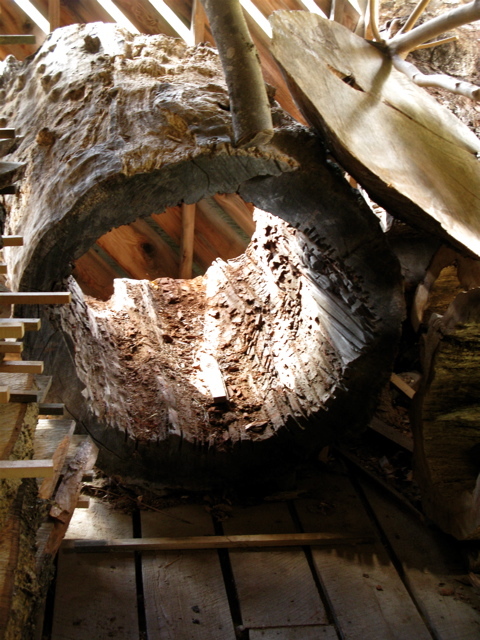 *Richard Foye does not have internet access at his studio, but he may be reached by calling 802-348-7927, (Richard’s South Newfane, Vermont studio is open by appointment, please call for directions). 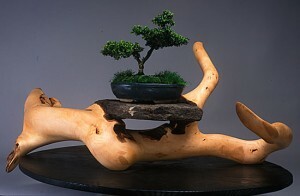 He is represented in New England by the Rice/Polak Gallery in Provincetown, Massachusetts. 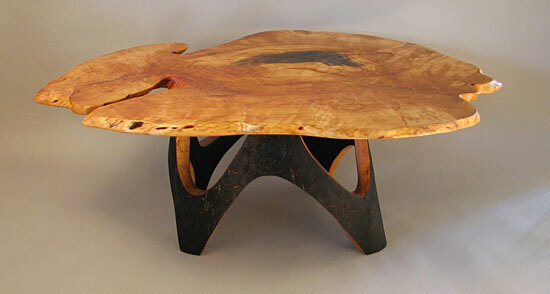 You are currently browsing entries tagged with Vermont Artisans at The Gardener's Eden.